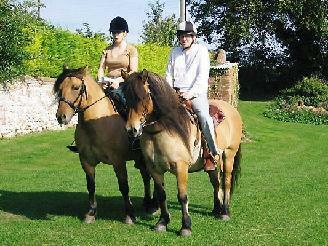 Highland pony enthusiasts club ride (Burnham Thorpe). Driving up to Burnham Thorpe, Norfolk from Ramsey, Cambridgeshire on a Friday after work seemed like a good idea at the time but as my Dad steered the Shogun and trailer around another tight country lane, it didn�t seem like such a good idea. But after an epic journey we arrived at our very warm and welcoming bed and breakfast at Whitehall Farm. The land lady even picked us up a Chinese take away as we settled Fernilea of Talisker and Coulmore April in to their nice warm stables. The next day we decided to go on a nice ride down to the beach (as the HPEC ride was not until the Sunday and we had decided to make the weekend into a bit of a holiday). As we rode down toward the beach I could see the anticipation in my Fianc�s eyes, he has only been a month but I knew April would look after him and that he would enjoy this weekend and after all, how often do you get to ride along the beach. We rode that morning through beautiful countryside, miles of meadows and hills and we stopped for a picnic lunch just short of Holkham beach with the ponies and our parents. 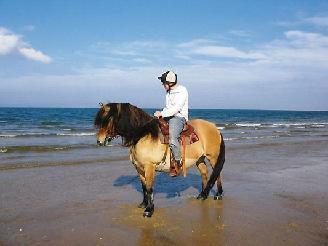 Then we reached the beach, it was a glorious day as we trotted the ponies across the golden sands down towards the sea. Both ponies were not too fond of the white crest of the waves coming down to devour them, but with a little gentle persuasion they strode into the sea. As I led Andy through the waves I could hear his laughter as the ponies swam and at that time I realised I was right to bring him on this weekend. As we rode back to the bed and breakfast I believe Andy suffered from the new riders partner, saddle sores, and I was worried that he would not want to participate in the ride the next day. On the morning of the HPEC ride Andy awoke to realise that saddle sores do not disappear overnight, but there was no stopping him from doing the ride, so we decided to go nice and slow. Although there was no beach this time, we where spoiled by the tranquil countryside and beautiful scenery. As Fernilea had been pulling my arms from their sockets the whole duration of the ride, I had a good look around to see where the other ponies where and if it was safe for us to have a gallop. I decided to let Lea stretch her legs and as we lunged into a gallop Andy and April where not far behind, and he was supported by several cheers from the group riding behind us. 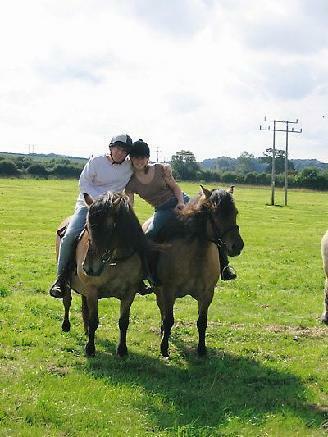 When we arrived back to Whitehall farm, both ponies had obviously had a great time and where still rearing to go, we even considered another once around the block! 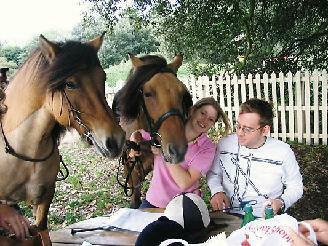 However a fish and chip lunch was not far away and as my Dad helped load the horses after lunch we learned to a great extent that it wasn�t on to double book the rider cup weekend with a horse meet, however im sure that even Tiger Woods would have enjoyed those two fantastic rides in the beautiful countryside.